Destiny Reimer 5′ 9 CG Anchorage Christian High, Anchorage Alaska- Destiny Reimers is a do it all type of player, in that she can comfortably and defend multiple positions. Reimers can handle the ball well enough to play the point position, can shoot and rebound, play the 2-3 positions and we watched her effectively guard a 6’6 player in the post. Reimers can flat out play and should be on the radar of many coaches. Anyah Shamburger 5’9 F Los Osos High School, Rancho Cucamonga CA- Shamburger stood out she displayed her athleticism on the offensive and defensive ends of the court. Shamburger is a force on the boards and can finish in and around the basket. Hamburger possesses a nice touch on her mid range shot, and can get to the basket using a variety of slashing moves. If Shamburger can master ball handling and the three ball, the sky is the limit. Zion Walters 5’10 F/G 2020 Millenium High School, Goodyear AZ- Zion Walter is an intriguing prospect, every time we see Walter she has gotten better and a bit taller. Walter is an athletic hybrid type of player who can compete at multiple positions. Walter defends extremely well, rebounds and finishes near the basket. If Walter continues to improve her ball handling and floor vision, she could be a steal at the next level. Malaysia Gibson 6’2 F/C Sierra Linda High School, Phoenix AZ- Malaysia Gibson has the size and footwork in the post and is a strong enough player to be a problem for opposing defenses. Gibson is still developing and can be a force if she masters a ;mid range shot. Keep an eye on Gibson this season. 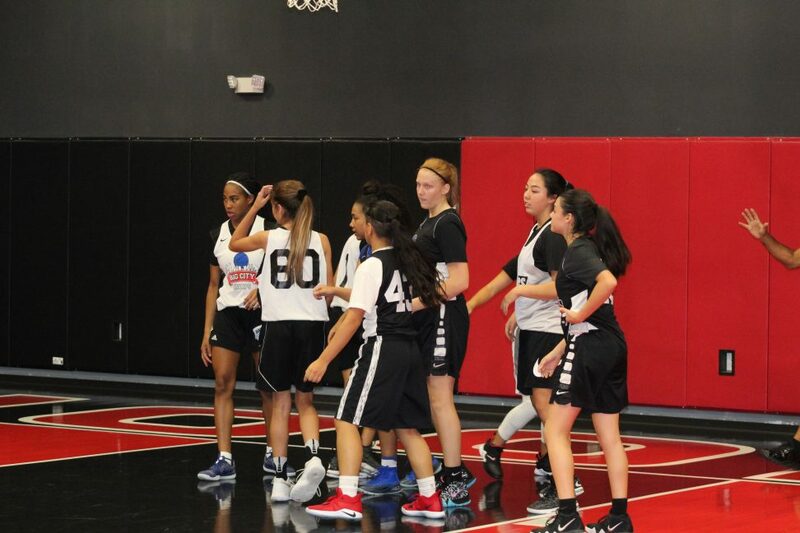 Amaya Vasquez 6’2 F/C Buckeye High School, Buckeye AZ- Amaya Vasquez is another Arizona post player that has a ton of potential at the next level if she can continue to polish her game. Vasquez rebound and passes out of the post well and has above average footwork to Make it hard for defenders to guard her. Vasquez will be huge part for her Buckeye High team. Dustee Murrell 5’10 F Copper Canyon High, Glendale AZ- Dustee Murrell is a long and athletic player who has a nice touch on her shot from the three point stripe. Murrell handles the ball well and due to her length she can defend several positions and get steals in the passing lanes. Dustee Murrell has a high basketball IQ can be a big time player if her game continues to develop. Leslie Aguirre 5’5 PG Sunnyslope High School, Phoenix AZ- Leslie Aguirre is a solid PG who has a high basketball IQ who sees the floor extremely well and passes with efficiency. Aguirre plays with a lot of energy and desire, Aguirre also continues to improve every time we see her. Rebekah Stein 5’5 PG Tempe Prep Academy, Tempe AZ- Rebekah Stein is a tough hard-nosed PG who competes and doesn’t back down from competition. Stein handled the ball well and can see the floor especially in transition. Stein had several slashing moves to the basket, which allowed her to get to the would line. Stein should have a big year for Tempe Prep. Mariah Clark 5’9 F Pueblo High School, Tucson AZ– Mariah Clark was injured prior to the showcase but was in attendance, Clark should be one to watch this high school season for Pueblo as she was a major part of the push to the state title game this past season.